Owner.. Isle of Arran distillers. Arran is both beautiful and unique. With its mountains, lowlands, glens, lochs and royal castles, it has all the scenery of Scotland and affectionately known as ‘Scotland in Miniature’. Our Distillery was opened in 1995, at Lochranza, in the north of the Island. During the official opening ceremony, two golden eagles, who live on the mountain behind the Distillery provided a fly past as a ‘thank you’ for halting building work for several weeks to allow them to hatch their chicks. On a warm summer’s day they can still be found, floating high on the thermal currents, before dropping like a stone, hunting their quarry. The Island has a reputation for producing the highest quality whisky. We only use the traditional methods of distilling, with wooden washbacks and copper stills, designed to our exact specification. We don’t use peat in the production process or caramel for artificial colouring – unlike many other distilleries. And all our Single Malts are non-chillfiltered, which means they’re natural in pigment and exactly the way whisky should be! 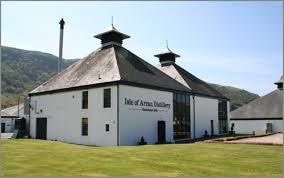 Pictures courtesy of Arran distillery.